The HeartRise Chakra Necklace was designed by Tamika & Katterinhe to assist in balancing the entire chakra system in the most beautiful way. 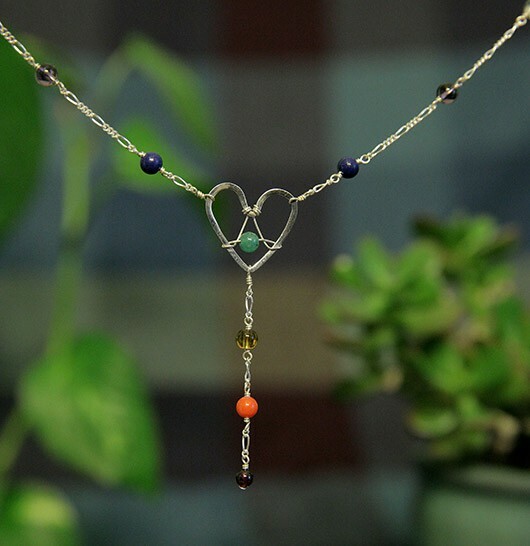 In honor of the rainbow bridge of color within all of us, this sterling silver necklace contains a semi-precious bead for each chakra, and a beautiful silver heart that rests above your own. 1st Chakra: Garnet activates the root chakra. This stone is known to cultivate feelings of greater security and inner strength, grounding and revitalizing the wearer. 3rd Chakra: The third chakra is marked by a mixture of semi-precious stones that together create a soothing orange color to support decision-making, personal will and inner resolve. 4th Chakra: Jade is known as the healer of hearts. It also represents the abundance, health and peace of mind that comes from slow, steady growth. Jade is said to carry the signature of nature into even the most artificial environment. 5th Chakra: Lapis Lazuli is a stone of truthful communication, freedom from negative thoughts, and enhanced inner peace. It is also known for improving overall health. 6th Chakra: Amethyst symbolizes spiritual wisdom and growth. This stone is known to support your connection to the Divine, enhance meditation and intuition, and help release emotional blockages, supporting your creativity. 7th Chakra: Clear Quartz is known as a cleansing, healing and purifying stone that has the potential to enhance memory, amplify intentions, and create greater overall harmony. All jewelry was lovingly handmade for DevaTree by Katterinhe Franco, a beautiful and gentle soul who is also a mother, Costa Rican artisan, traveler, and beloved friend of DevaTree.